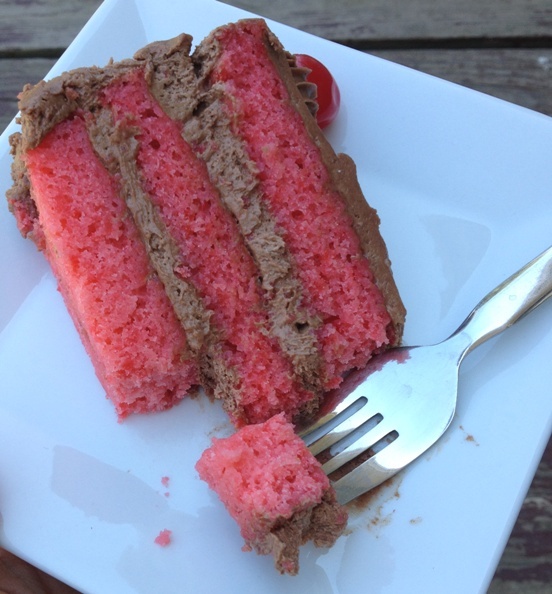 I want to revisit cherry chip cake. I haven’t made it in a few months but I am wishing for a big slice right now. Cherry season is over but this recipe only relies on maraschino cherries from a jar and they are ALWAYS in season in my world. This is a simplified version of my other cherry chip cake recipe. 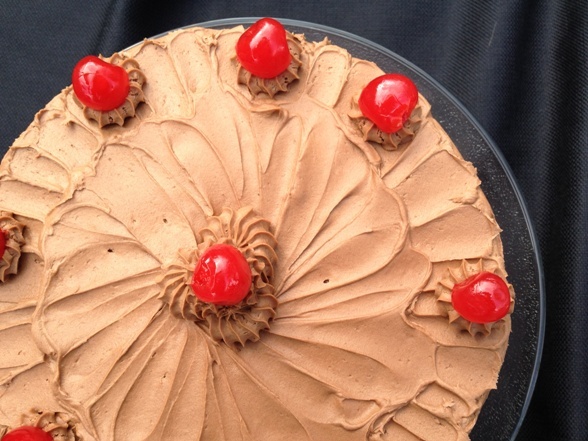 With the addition of the chocolate icing it mimics a chocolate covered cherry. Yummy! Need some now! Aside from “needing” a large slice of cake right now, I have another issue in my house. Fruit flies. I have an infestation!I am blaming it on the fall harvest. As usual my dad and I have a large community garden plot and, as usual I planted tons of tomatoes to can along with lots of assorted other veggies/herbs. I’m all done canning/pickling/freezing but the piles of tomatoes, cukes, zucchini, chard, basil, dill, potatoes, peppers, etc, that came in to this house have produced an equally large crop of fruit flies. A bumper crop! I still have many zucchini and some tomatoes ripening plus I finally have some Michigan peaches from the market. It’s not helping the fruit fly problem. Are fruit flies a long forgotten plague? They seem to be here. Clouds of them are terrorizing us. The great chipmunk war of 2014 is over. There were over a dozen casualties – along with an innocent bystander, RIP Mr. Cardinal. Now that the dust has settled I am waging a new war on fruit flies. You can buy fruit fly fly traps or make them from tutorials online (that don’t work in my experience) or . . . you can use wine. Every time I drink a glass of wine some little fly carcass ends up in my glass. So I gave them their own glass. It’s been sitting on the counter for 2 days with a bit of wine and I have killed/captured 44 fruit flies. Yes, I counted them. Probably more than that now because I last counted 2 hours ago. Apparently they are wine lovers and our fruit fly winery is open for business! I just pour a drizzle in the glass, let it sit and attract alcoholic flies for a few hours and then I pour it all out on my front lawn. Wine and carcasses and all. And then I start the process all over again. Emptying the glass outside is important. I know some of those flies are probably playing possum so if any are just happily drunk doing the back stroke in the wine I make sure to release them out doors and not down my drain where they’ll sober up and fly back out. If anyone else is suffering the fall harvest plagues of the fruit flies I highly recommend this wine capture method. Don’t waste your expensive wine on them. They love the cheap stuff. Fortunately, I do too! Back to the cake. This is very easy and way better than the boxed version. It’s less “chippy” as I opted to just use my food processor to quickly pulverize the cherries. I ended up with more of a puree. 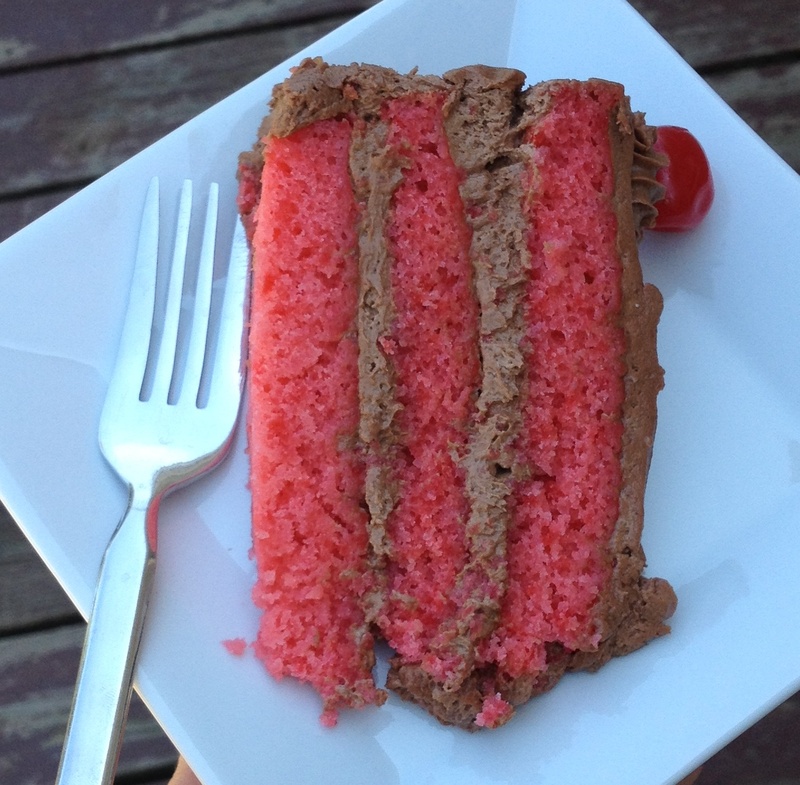 It resulted in a lovely pink cake but not the usual flecks of pink among white cake that you would get otherwise. If you prefer that, do as I say not as I do and roughly chop the cherries. I generally make a cherry-esque buttercream to go with this but how perfect is it make this into a chocolate covered cherry chip cake? Amazing! This easy chocolate buttercream is my adaptation of Nigella Lawson’s (homecooking/baking goddess) fudge icing and it’s my favorite. Great on a cake, on a graham cracker or on a spoon. Enjoy! Drain the cherries and save the juice. Set the juice aside. Roughly chop the cherries and set aside. In a large mixing bowl (I use a stand mixer) beat the butter and sugar together until light and creamy. It will take a few minutes. Add the eggs, milk, almond extract and reserved maraschino cherry juice. Mix well to combine with the butter mixture. It will look curdled, don’t worry, it will all come together with the dry ingredients. Add the flour, baking powder & salt. Mix until the batter comes together. Add the chopped cherries and stir in. The better will be thick. Divide evenly into the 3 prepared cake pans. Spread batter out evenly in each pan. Bake for 20-25 minutes or until toothpick inserted in to the center of the cake comes out clean. Allow cakes to cook before removing them from the pans and icing them with chocolate fudge frosting. In a large mixing bowl whip the butter until fluffy. Slowly add the powdered sugar 1/2 cup at a time. Add the vanilla and the salt. Beat in the chocolate and whip until the frosting is light and fluffy. Use frosting to ice the cooled layers of the cake. 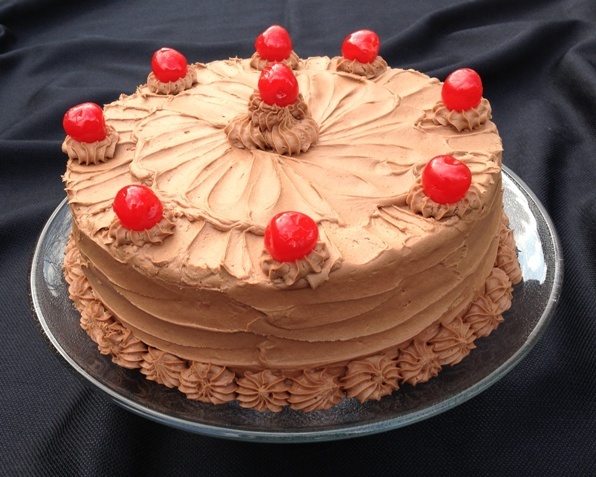 Posted in Sweet and tagged cherry chip, Chocolate, chocolate fudge cake, homemade cherry chip cake, Marachino cherry. Bookmark the permalink.